Gold’s Gym Challenge helped firefighter Tom Bernier lose 30 pounds. 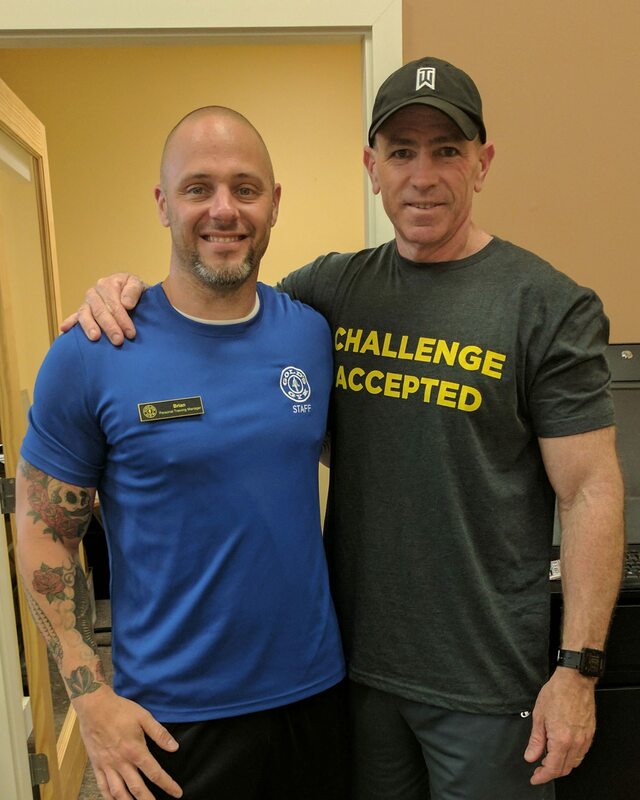 Through the Gold’s Gym Challenge, firefighter Tom Bernier transformed his life to keep saving others. On an afternoon in March 2007, Tom Bernier was fighting an apartment fire in Taunton, Massachusetts, when someone told him there was a baby stranded on the third floor. Along with a colleague, he climbed up the fire escape, smashed a window and crawled into the blazing building. They searched everywhere. By the time they realized there was no baby, they were almost out of air. 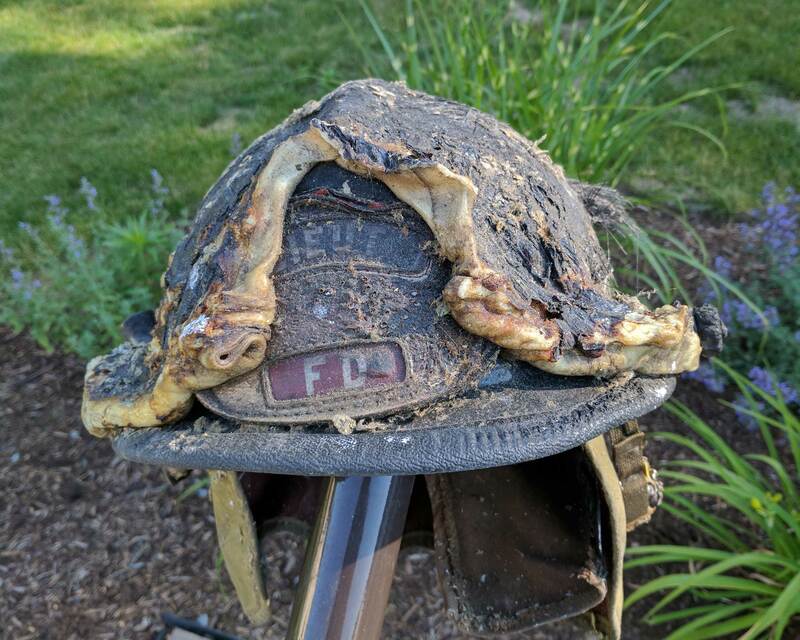 Tom Bernier’s helmet from the 2007 fire. To make matters worse, the wind had shifted, trapping them in the front of the building with no way out. Tom found a window and yelled “mayday,” hoping someone on the ground would hear him. No such luck. In desperation, his colleague threw a helmet out the window to attract attention. A ladder went up, and Tom and his colleague escaped in the nick of time. Looking back, Tom is sure that his physical fitness was key to his survival. “Our cardio training helped extend our time, so we could do the search with the air we had left,” he says. If they hadn’t been strong and quick enough, he adds, they would not have made it through the entire third floor search and would have gotten trapped by the fire halfway through. In the months and years that followed that terrible fire, Tom’s fitness level fluctuated. Tom joined Gold’s Gym in 2012, looking to add variety to his workouts. He’s experienced a handful of back and shoulder injuries during his career, but his biggest setback was in 2014, when his mother passed away and he stopped working out. Eventually, Nancy, his wife of nearly 30 years (they were high school sweethearts) and an avid gym member herself, encouraged him to begin taking his fitness seriously again. Tom wanted to be as fit as he was when he first joined the fire department in 1988. In January 2017, he signed up for the Gold’s Gym Challenge. During his initial fitness assessment, Tom struggled to do three pull-ups and became winded after just a few push-ups. Under the guidance of his personal trainer, Brian Diercksen (left), Tom did weight training and used elliptical and rowing machines. He cut out late-night snacking, reduced his carb intake and turned down the delicious firehouse meals prepared by his fellow firefighters. He laughed when they teased him for opting for turkey burgers and vegetables. When things got tough, Tom reminded himself of something he says to his children and to kids he mentors: “Be the leader and not the follower.” Even when he didn’t feel his best, he continued to train, and that made him feel better. Nancy was a key motivator, too. As the Challenge went on, Tom could see the results of his work. His clothes were getting too big, and everyone was complimenting him on how he looked. At the end, Tom placed first in his age division in the Challenge, losing 30 pounds. And, he emphasizes, “I only got stronger.” He could now do 59 push-ups in a minute and at least 12 pull-ups. As a joke, his fellow firefighters took a poster celebrating his success from Gold’s and put it up in the firehouse. Now, Tom says, they touch it for good luck. Tom’s daughter jokes that her dad is “Gold’s for life,” and he couldn’t agree more. Although Tom still thinks about that disastrous fire in 2007, his fitness success has made him more confident in his abilities. He has only two years left until retirement and says he plans to go out “in one piece.” For now, though, he’s content to spend his free time with Nancy and their two children, as well as maintain his busy schedule doing volunteer work. Tom mentors students and serves on a committee at his former high school, and he teaches golf to kids through the development program The First Tee. Beyond that, he’s more than ready for whatever challenge is next.